Pigment Yellow PY167 is a semi-opaque, bright greenish yellow with moderate tinting strength. 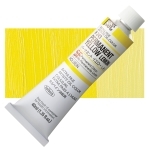 Althought not absolutely lightfast, Pigment Yellow PY167 has very good lightfastness. Its permanence is comparable to the better yellow monoazo pigments. Pigment Yellow PY167 is not considered toxic. Seikafast Yellow A-3 has been used in paints and inks.